Finke is a distance swimmer who trains under Fred Lewis at Saint Petersburg Aquatics. She competed in the 800m free at 2012 US Olympic Trials and is qualified for 2016 Trials in the same event. This past summer Finke competed at Speedo Junior Nationals, Phillips 66 Nationals, and the US Open Water Nationals. Finke’s mile and 500 free times would have scored in the B-finals of the 2014 ACC Championships, and her 400 IM would have made the C-final. 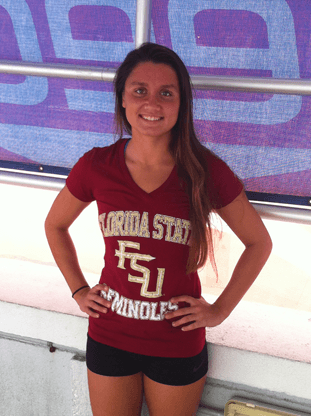 She will have a year to overlap with the Seminole’s most accomplished distance swimmer from last season, Madison Jacobi, who will be a senior when Finke arrives in Tallahassee. Finke joins Massachusetts commit Meg Brown in the FSU class of 2019.